Update 20 January: This campaign was successful. Click here for details. Take action to contact your representatives in the European Parliament before 20 January to strengthen baby food marketing regulations. Here is a quick explanation and instructions on what to do. New regulations produced by the European Commission (the civil service of the European Union) were scrutinised by the European Parliament Environment, Public Health and Food Safety Committee (ENVI) last week. These are for marketing of baby foods and formula. Keith Taylor MEP tabled three objections calling for improvements. The one on the baby food regulations is going forward to the full Parliament. We need all MEPs to vote in favour to prompt the Commission to think again. The ENVI Committee voted for sugar levels in baby foods and recommended age of use be brought into line with World Health Assembly Recommendations (i.e. sugar levels reduced and no labelling baby foods as for use before 6 months of age) and for “zero tolerance for pesticides should apply as a general principle”. The motion suggests that the pesticide glyphosate, as an example, should be added to the active substances where a maximum value is specified and stricter maximum values introduced over time. Click here for WHO’s commentary on sugar. Exclusive breastfeeding is recommended to six months and only infant formula is needed for this period if not breastfeeding. The ENVI Committee motion now goes to the full Parliament and we have to win the vote there. The vote will take place on Wednesday 20th January. Ask the MEPs for your constituency to vote in favour of Keith Taylor MEP’s Objection pursuant to Rule 105: processed cereal-based food and baby food (B8-0067/2016). Two votes, aiming to stop promotion of follow-on milks and foods for special medical purposes, and reduce pesticide levels in formulas, were lost at the ENVI Committee. We will instead have to work country-by-country to support governments to implement World Health Assembly marketing requirements. If you are in the UK contact your Member of Parliament before 19 January. Where does this leave us, what happens next and what can you do? Click here to jump over the explanation to the quick actions that need to be taken during the next few days. Although the new regulations will not be brought into line with the International Code of Marketing of Breastmilk Substitutes and subsequent, relevant Resolutions of the World Health Assembly, Baby Milk Action and our colleagues had already won some changes at an earlier stage in the process when the Commission put draft text – called the Delegated Acts – out to consultation. We were one of the few civil society groups attending meetings with the Commission (usually my colleague Patti Rundall, our Policy Director). Among the improvements we managed to get from the Commission, was new specific wording requiring all exports from the EU to be understandable (see paragraph 12 below) and 3 extra paragraphs: about the International Code, risks of advertising and links to concerns about obesity. These are important for persuading policy makers at national level to take action. We also demonstrated to the Commission that the current regulations fail to stop cross promotion of infant formula brands through other products, so the language in the Delegated Acts was toughened up to make it even clearer that infant formula branding and package text, images and colours should be clearly distinct from those used on follow-on formula. At the moment products look like this to make the infant formula brand the focus across the range. We will use the new Delegated Acts to try to stop the infant formula brand and package styling being used on other products and in advertising. But the Commission would not introduce an outright ban on follow-on formula promotion, which would have been the far simpler approach. Now it falls to individual governments to take the necessary action to introduce this ban (as Luxembourg has already done). Bottle feeding is being promoted with the suggestion it benefits babies, as in this current television advertisement from Danone (left and below) for its Aptamil brand. Danone’s advertising implies its formula turns babies into mathematical geniuses and gives them the strength, stamina and balance to be ballet dancers. Even if Danone does stop using the infant formula brand name Aptamil for the follow-on formula when the Delegated Acts come into force, this advertising is still misleading and should be stopped. The Commission would not act on our request to cut the permitted level of sugar allowed in baby foods, which could be as high as 30% of the energy content, nor would it cut the level of pesticides. Nor would it address the problem of optional ingredients added to formula (including those for vulnerable infants who require specialist feeds) before they have been independently checked for efficacy and safety – arguing that this would aid innovation. And so the battle to protect infant health moved to Parliament. The ENVI Committee had a final opportunity to scrutinise the regulations and Keith Taylor MEP tabled the three objections at a meeting in December. The vote was moved to 14 January, giving us the opportunity to quickly mobilise supporters to contact members of the Committee. The objection calling for lower sugar levels, 6 month minimum age of use on labelling, in line with World Health Assembly recommendations. It suggests that the pesticide glyphosate, as an example, should be added to the active substances where a maximum value is specified and stricter maximum values introduced over time. This will now go to the full Parliament on 20th January (click here for text). We will need your help again to call on MEPs to vote in support of the objection. The Commission will then have to think again. The objection on formula marketing and pesticide levels in formulas was not passed (click here for text). Nor was the objection to the lack of controls on the marketing of foods for special medical purposes (click here for text). Some of the MEPs our supporters contacted said they would vote in favour. Indeed, the UK Labour Party members of the ENVI committee even broke with the majority of their colleagues in the Progressive Alliance of Socialists and Democrats in the European Parliament to vote in favour of all three objections. Click here to see how MEPs voted. So why did some MEPs vote against? 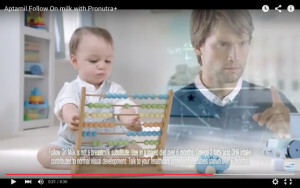 From responses from a Conservative MEP, it seems the view is if companies talk about “moving on” from breastfeeding when promoting follow-on formula they can have a free pass to target parents, regardless of the fact that follow-on formulas and growing-up milks are potentially harmful and the World Health Organisation and NHS say they are unnecessary. The call to end advertising of foods for special medical purposes was rejected by this MEP with the argument parents require information. Advertising is not information, it is promotion. Companies are increasingly trying to medicalise infant feeding and promote specialised products. Allowing these to be advertised in parenting magazines does not help parents, but encourages them to self-diagnose supposed diet-related disorders in their babies and then buy expensive products as supposed solutions. The “buyer beware” approach of “free market” ideology may be justified when it comes to what adults put into their bodies, but surely products for infant and young child feeding should be treated differently. And surely mothers who use formula deserve protection from unscrupulous companies as much as mothers who breastfeed. While the improvements in the text regarding cross-promotion may work to protect breastfeeding (which remains to be seen), mothers who use formula have been failed by those who voted down the objections. What happens next with the formula regulations? What can you do? 1. Right now, if you are in the UK, contact your Member of Parliament and ask them to support the proposed All Party Parliamentary Group on Infant Feeding and Inequalities. We need the APPG to get off the ground to help policy makers in the UK Parliament do as much as they can to protect mothers, babies and their families. The crucial date is 19 January, when the meeting for formally set up the group will take place. Click here to contact your MP. 2. Baby Milk Action will continue to monitor company marketing practices and bring – and win – cases at the Advertising Standards Authority against misleading advertising of follow-on formula and growing-up milks. The ASA system has little effect as its rulings come only after advertisements have been run and it levies no fines and requires no corrections. But the rulings do prove the companies cannot be trusted as sources of information. We will continue to do what we can to raise awareness of these rulings amongst parents, health workers and policy makers. And we will never give up campaigning to protect all parents from misleading promotion, whether they breastfeed or use formula. [Para 12] Given the particular role of infant formula and follow-on formula in the diet of infants, it is important to ensure that products exported to third countries provide food information in a language easily understood by parents and caregivers, in the absence of specific relevant provisions established by or agreed with the importing country. Art 6.5 All mandatory particulars for infant formula and follow-on formula shall appear in a language easily understood by the consumers. As we have reported previously, restrictions on exporting formula labelled in the wrong language were going to end. Surprisingly the industry seemed content for this to happen, despite Danone claiming it has to ration formula sales in Europe due to people buying up formula in supermarkets to send to China. Our investigation has found bulk exports of Danone formula in China. These are illegal if incorrectly labelled – and will continue to be so thanks to the above change. ← STOP PRESS: MEPs call for sugar levels in baby foods to be reduced.